We are pleased to introduce a new researcher into the Pandolfi lab in 2019. 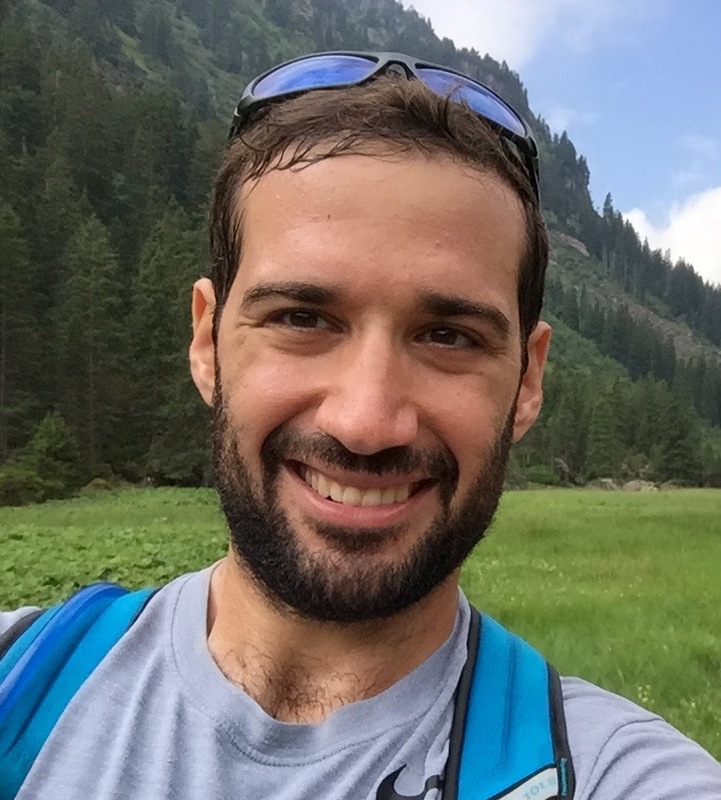 Gal officially joined the Marine Palaeoecology Lab in October 2018, he is currently working as Marie Skłodowska-Curie postdoc fellow conducting research on Mesophotic Coral Ecosystems (MCEs), coral reef ecology, physiology, adaptation, and ecosystem dynamics using ecological and technological tools. He moved to UQ from Israel (his home nation) after eight years in the Interuniversity Institute for Marine Sciences of Eilat (Red Sea) and Tel-Aviv University, where he obtained his M.Sc. and Ph.D. under the supervision of Prof. Yossi Loya. 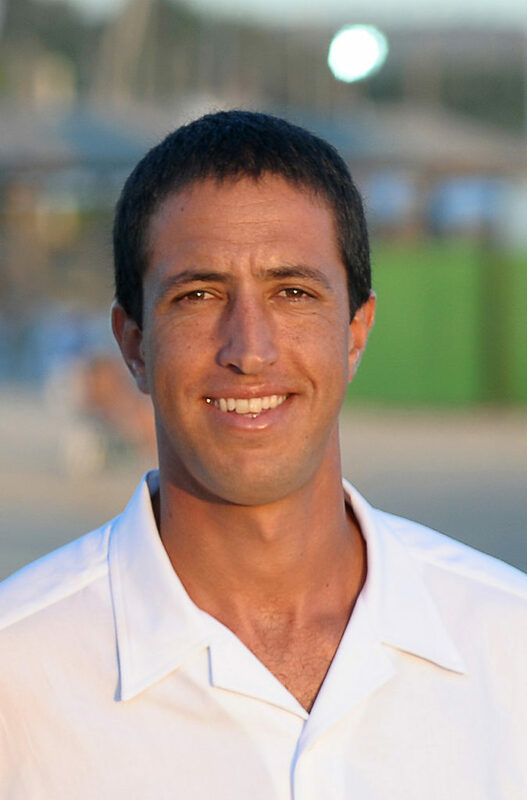 His past research has concentrated on ecology, taxonomy and physiology of mesophotic scleractinian corals in Israel (Mediterranean and Red Seas), as well as development of new approaches to study the unique MCEs. We are pleased to introduce two new researchers into the Pandolfi Lab in 2018. 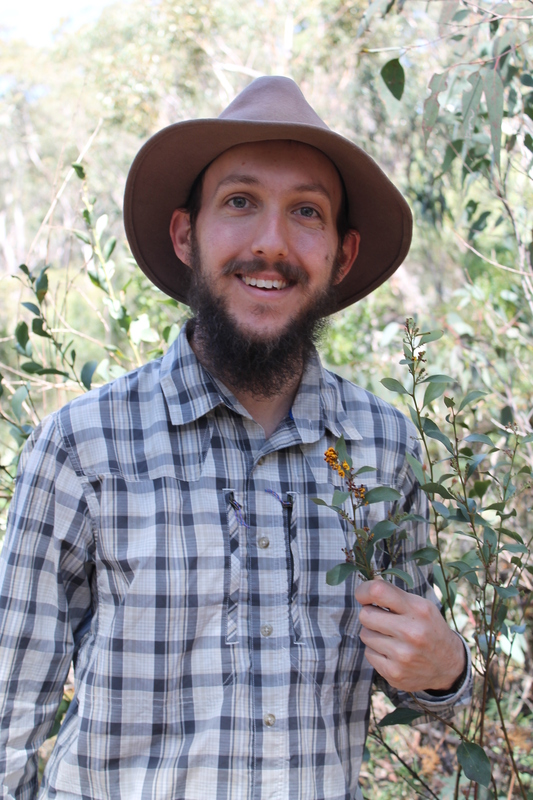 I am a community and quantitative ecologist whose research explores community ecology questions in a range of taxa and systems. I am particularly interested in the application of functional traits and statistical techniques to improve our understanding of how natural communities form and function, and how they change over time. My past research has examined mechanisms of coexistence between closely-related wildflower species, the relationship between species diversity and primary productivity in reforestation plantings, whether evolutionary context alters relationships between plant functional traits and growth rate, and predicting whether reforestation efforts are likely to develop expected conservation and carbon storage benefits. I am also interested in the research habits of ecologists, particularly in their publication and citation habits. I have been involved in a collaborative project examining the use of community ecology theory in restoration ecology experiments. I have also examined the interconnectivity in applied ecology more generally by web scraping publication and citation data. My current research in the Marine Paleoecology lab is focused on using datasets of fossil coral to study communities over large time periods, something that is nearly impossible for communities of other long-lived taxa (e.g., trees). Some of my research projects include studying patterns of co-occurrence between coral, both community membership and actual interactions, and with PhD student Malyon Bimler, whether theoretical concepts of community stability are realistic for real-world community data. Nick Hammerman is joining the lab in April of 2018. 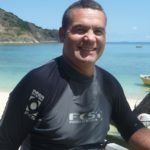 He is originally from the United States where he obtained his Bachelors in Marine Science at Roger Williams University and then completed his Masters in Biological Oceanography at the University of Puerto Rico, Department of Marine Sciences. His work mostly dealt with population genomics, phylogeography, as well as species interactions and diversity on both shallow and mesophotic reefs. His current PhD project revolves around paleoecology of coral reefs. Recent funding for ‘Managing regime shifts and fisheries collapse on the Great Barrier Reef – the role of ancient DNA’ was awarded from BGI Australia’s call for proposals on new research involving genomic applications in biodiversity and evolution. This research project will allow us to gain insight into the palaeoecology of reef organisms that do not leave a substantial fossil record by analyzing the ancient environmental DNA that has been preserved in the marine sediment. In collaboration with BGI Australia and the Riginos lab at UQ, we will reconstruct past occurrences of several important reef organisms, including macro-algae and fish, over a gradient of increasing human impact. Centuries-old nautical charts, mapped by long-deceased sailors to avoid shipwrecks, have been used by modern scientists to study loss of coral reefs. 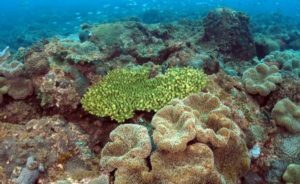 A new US and Australian study – including research from The University of Queensland and the Australian Research Council Centre of Excellence in Coral Reef Studies – compared early British charts to modern coral habitat maps to understand changes to reef environments. 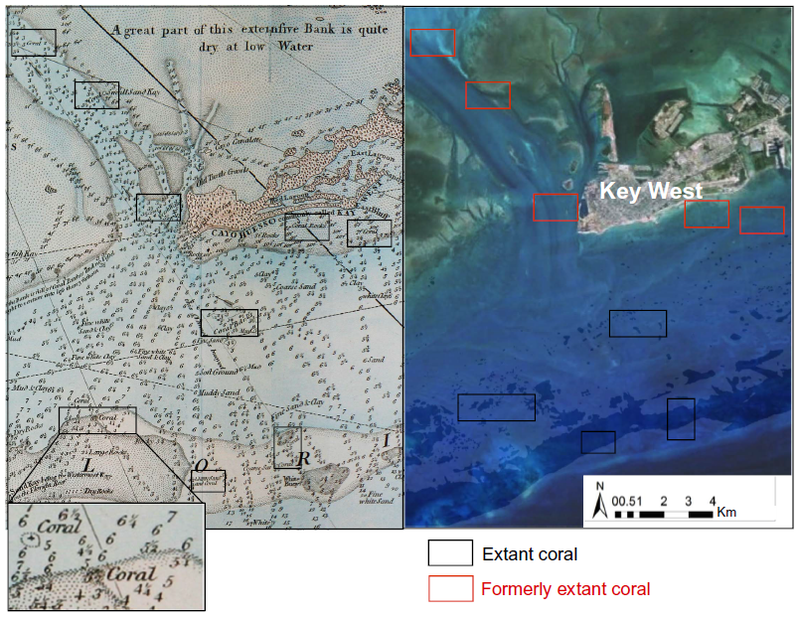 UQ’s Professor John Pandolfi said the study used information from surprisingly accurate 18th century nautical charts and satellite data to understand coral loss over more than two centuries in the Florida Keys. “We found that some reefs had completely disappeared,” Professor Pandolfi said. The study was led by Loren McClenachan, Assistant Professor at Colby College, in Waterville, Maine, USA. Professor McClenachan said more than half of the coral reef habitat mapped in the 1770s was no longer there. In some areas, particularly near land, coral loss was closer to 90 per cent. “We found near the shore, entire sections of reef are gone, but in contrast, most coral mapped further from land is still coral reef habitat today,” she said. This estimate of change over centuries added to modern observations of recent loss of living corals. Professor McClenachan said the findings had important conservation implications and pointed to a shifted spatial baseline. “We tend to focus on known areas where we can measure change. That makes sense. Why would you look for coral where you never knew it was?” she said. The authors said when large-scale changes like this were overlooked, scientists could lose sight of past abundance, lowering expectations for conservation and recovery. Media: Professor John Pandolfi, j.pandolfi@uq.edu.au, +61 7 3365 3050, @JohnPandolfi, @CoralCoE; or Professor Loren McClenachan, lemcclen@colby.edu, Cell: 1 207 509 4419, @LMcClenachan, @Colby. 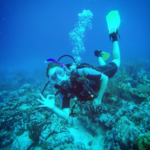 “We sought to investigate the ecological and evolutionary processes that shape coral biodiversity patterns at their southern range limits,” she said. Dr Sommer said it was important to conduct such studies to understand the stability of the species’ environmental tolerances and the ecological drivers of biodiversity patterns so scientists could more accurately predict species’ range shifts and ecological responses to climate change. “For example, if characteristics such as environmental tolerances are stable over time and don’t change, then corals will likely only expand their ranges to areas where environmental conditions are similar to where corals currently occur,” Dr Sommer said. “And corals will probably have less capacity to adapt to novel environmental conditions”. “Our results suggest that species that occur in these subtropical and temperate reefs south of the Great Barrier Reef are more closely related to each other and have more similar characteristics than the coral species that occur on the Great Barrier Reef. Results suggested competition by corals for space and light were also important drivers of biodiversity patterns at local scales. “These findings indicate that coral biodiversity patterns south of the Great Barrier Reef are shaped by a combination of regional and local processes,” Professor Pandolfi said. Species unable to persist in these cooler and darker conditions were initially excluded from the region and the remaining species then divided into local sites, depending on whether species interactions or environmental conditions were more important locally. The study, which involved researchers from the Australian Research Council Centre of Excellence for Coral Reef Studies, the ARC Centre of Excellence for Environmental Decisions at UQ, University of Leeds, Southern Cross University and CSIRO Marine and Atmospheric Research, is published in the Proceedings of the Royal Society B. We are excited to announce that we have a number of new PhD and Post-Doctoral researchers starting in the Pandolfi lab this year. Steve Dalton is a post-doctoral researcher in the School of Biological Sciences University of Queensland, but situated at the National Marine Science Centre in Coffs Harbour. Steve has extensive knowledge of marine habitats along the NSW and southern QLD coastline. He is currently undertaking research focussed on assessing the potential for tropical coral species migration to higher latitudes and understanding the mechanisms that enable warm water coral specialist to grow and persist at marginal reefs along the eastern seaboard. This work aims to assess the influence of elemental stoichiometry in corals and their symbionts in determining how changes in metabolic rates might define latitudinal limits in the distribution of reef corals. For more information see Steve’s profile. Nataly Gutierre Isaza comes to us from Colombia where she completed her Bachelors in biology, and she completed her Masters in Natural Resources and Rural Development in Mexico. She has an interest in reef dynamics and competition between hard corals and macroalgae, the causes of coral reef degradation as well as the traits involved in coral species adaptation to novel environmental conditions imposed by climate change. Her PhD will focus on the ecological stoichiometry of coral larvae along the latitudinal gradient in eastern Australia. For more information see Nataly’s profile. Karin Zwiep has returned to the Pandolfi lab to undertake her PhD after an eight-month research visit during her masters. Karin completed her masters of environmental biology and bachelor in biology at Utrecht University, Holland. She has been involved in research projects from crustacean-ciliate symbioses in Dutch waters to dinoflagellate cysts and pollen in the Mediterranean sapropels, as well as genetic diversity and connectivity of Symbiodinium in high latitude reefs along the Australian coast. ecosystems using ancient DNA. For more information see Karin’s profile. Marine Palaeoecology lab members have recently returned from the ARC Centre of Excellence for Coral Reef Studies – Coral Reef Futures Symposium held at the Shine Dome in Canberra on the 15th and 16th June, 2017. The Symposium featured more than 30 presentations from leading international marine scientists from the ARC Centre of Excellence, Exeter University, WorldFish, and the Great Barrier Reef Marine Park Authority, as well as a Public Forum hosted by none other than Dr Karl. 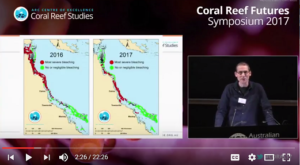 The coral reef futures title of the symposium invoked the findings of the recently released Nature paper by Hughes and colleagues that coral reefs can no longer return to their former glory due to the multitude of pressures they face, especially from global warming. Instead, important ecosystem processes and functions must be maintained to conserve healthy functioning reefs, and “the way forward is for research to inform and support reef governance and management to navigate the transition to new ecosystems that will maintain biodiversity, biological functions and support human well-being”. Lab leader Professor John Pandolfi presented the findings of the sub-tropical bleaching surveys undertaken in April 2016 to assess bleaching extent and October 2016 to assess mortality and recovery. Comparing findings with those from the Great Barrier Reef (GBR) he showed the coral genera impacted by bleaching in the sub-tropics differed to those genera along the GBR. See Professor Pandolfi’s talk here. The ARC Centre of Excellence for Coral Reef Studies holds a symposium annually. A complex and increasing range of environmental and legal policy initiatives have been established to conserve biodiversity by improving management of human activities and their impacts on marine environments. 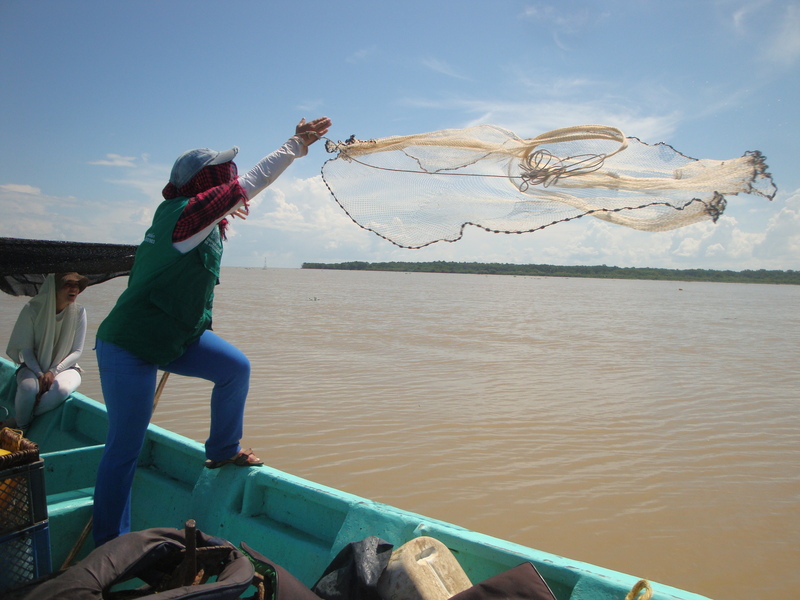 These policies include international agreements, laws and conventions along with those at the national and local level, and span many sectors including conservation, fisheries, and agriculture. Despite this array of policies, along with international and national levels of protection, the condition of Australia’s Great Barrier Reef continues to deteriorate. This trend indicates that policies are inadequate or the right policies have been prescribed but not effectively implemented. With colleagues from the ARC Centre of Excellence for Coral Reef Studies and the University of Queensland, I determined what policies influenced on-ground management of the Great Barrier Reef World Heritage Area and Marine Park and how these policies were implemented. Further, we identified challenges facing practitioners when applying these policies. 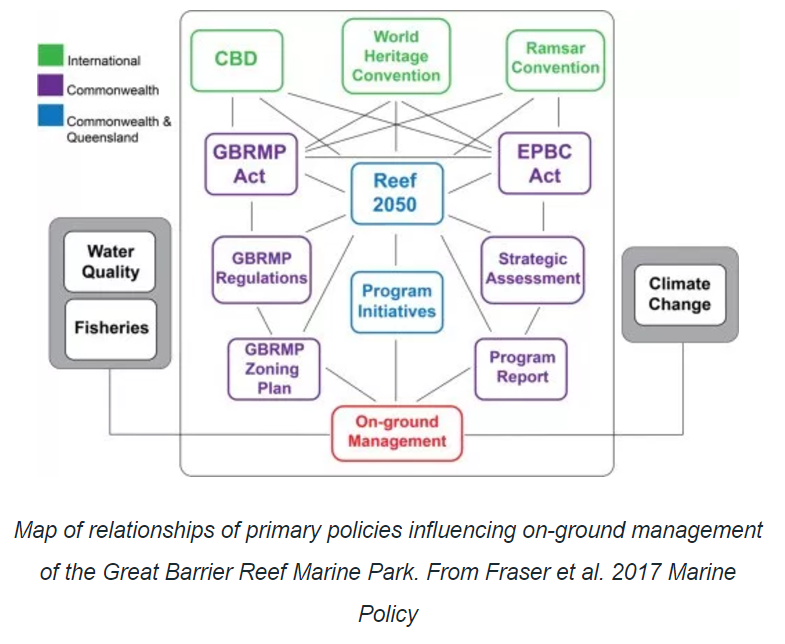 In undertaking this research, 19 key informant interviews were conducted across Commonwealth and state jurisdictions and agencies involved in managing the Marine Park, and extensive content analysis of policy instruments relevant to the Great Barrier Reef was undertaken. Effective policy implementation is a challenging task, limited by gaps between intentions and outcomes, inconsistencies, and conflicting agendas. Identifying how policies are put into practice and their efficacy should lead to improved understanding of whether the intent of international agreements, Commonwealth, and state policy is being realised, and whether this is impacting the ability of on-ground management to deliver effective outcomes for biodiversity. From the publication: Fraser, K. A., V. M. Adams, R. L. Pressey and J. M. Pandolfi (2017). 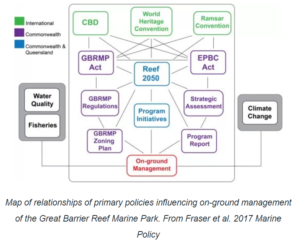 Purpose, policy, and practice: Intent and reality for on-ground management and outcomes of the Great Barrier Reef Marine Park. Marine Policy. 81: 301-311. A new study has ingeniously reconstructed a 103-year record of the Queensland east coast Spanish Mackerel spawning fishery, and revealed that catch rates have declined by 70 per cent over the past 80 years. The ARC Centre of Excellence for Coral Reef Studies and University of Queensland study documented the decline by combining data from historical newspapers with fisher memories. Lead author and UQ PhD graduate Dr Sarah Buckley of the Sea-Fisheries Protection Authority in Ireland said the decline has had substantial consequences. “For the past 20 years the Cairns fishery has been commercially extinct and the Townsville spawning aggregations have remained completely offshore,” she said. Co-author Professor John Pandolfi of UQ’s School of Biological Sciences and the ARC Centre of Excellence for Coral Reef Studies at UQ said the conservation of spawning aggregations of fish was one of a suite of management tools that could contribute to healthy fish populations. “Managers need to consider increased protection of Spanish Mackerel during this critical time if it is hoped that catch rates can be increased,” Professor Pandolfi said. Spanish Mackerel are large and important recreational and commercial fish found in Queensland and northern New South Wales waters. Annually they form huge aggregations for breeding purposes at discrete locations for a confined period of time in the Great Barrier Reef. Although this fishery commenced over 100 years ago, official commercial catch and effort were not recorded by the government until the 1980s, leaving large gaps in our understanding of long-term changes in the fish spawning aggregations, some of which disappeared undetected. 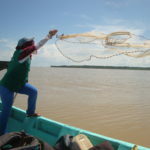 The scientists interviewed commercial fishers about their memories of changes to catch, gear and technology and locations fished, to reconstruct a valuable and comprehensive record. Co-author Dr Ruth Thurstan of Deakin University said Spanish Mackerel fishers were able to recall fishing from as early as the 1940s, providing a wealth of knowledge that could be used to plug these historical data gaps. Preventing decline and loss of fish spawning aggregations is a priority for the Great Barrier Marine Park Authority. 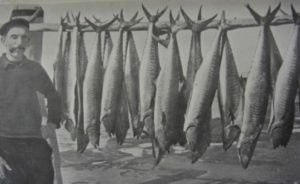 These data are currently being used by the Queensland government to inform stock assessment, demonstrating the valuable knowledge that is held by long-term fishers and in our local archives. Climate-driven change in the distribution of animal and plant species poses emerging challenges for humans, an international study has shown. University of Queensland marine biologist Professor John Pandolfi said species were changing their distributions globally in response to climate change. “New challenges for humans range from health risks to economic threats, and from conflict over fisheries resources to impacts on the supply of coffee and other crops,” said Professor Pandolfi, of UQ’s School of Biological Sciences. The study involved a large international team of scientists, led by Associate Professor Gretta Pecl from the University of Tasmania’s Institute for Marine and Antarctic Studies. 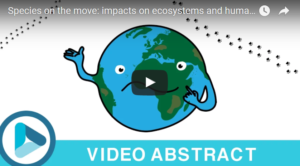 The team’s report said species are already responding to climate change, and human communities and economies from the tropics to the poles are affected. Original article published on UQ News. Publication in Science.